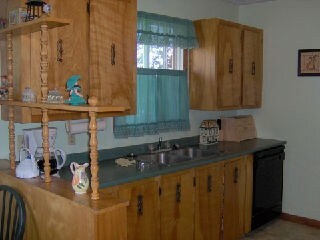 You have decided not to replace the cabinets, but rather to paint them to coordinate with your kitchen remodel. Choosing the right color is your next decision. This is a guide about kitchen cabinet paint color advice. 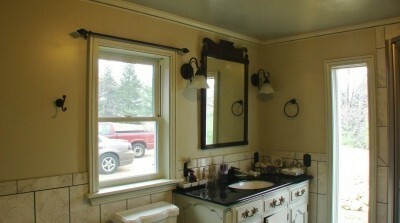 My cabinets are a light taupe, see door pic and the countertop is granite Hidden Treasure, see pic. I am trying to decide between 2 floors see 2 pics. One is more of a beige/grey/black and the other is more of a natural yellowy orange for warmth. What Benjamin Moore paint color for each floor and what floor do you suggest? I've been losing sleep over this! I recently purchased a home and won't be starting a kitchen remodel for 18-24 months. My biggest issue is the ridiculously dark cabinets and countertop. For the time being, does anyone have suggestions for cabinet and wall paint colors to brighten/neutralize the avocado green countertops and backsplash? I am not opposed to anything retro and love color. I actually would like to do accent pieces in bright orange. White cabinets would be OK, but I really like a two tone kitchen (top and bottom cabinets different colors). However, I'm concerned about the limited color choice, due to the green counter. I would greatly appreciate any feedback. Please excuse the mess, we're still in the process of unpacking and settling. I am in the process of renovating my kitchen cabinets. 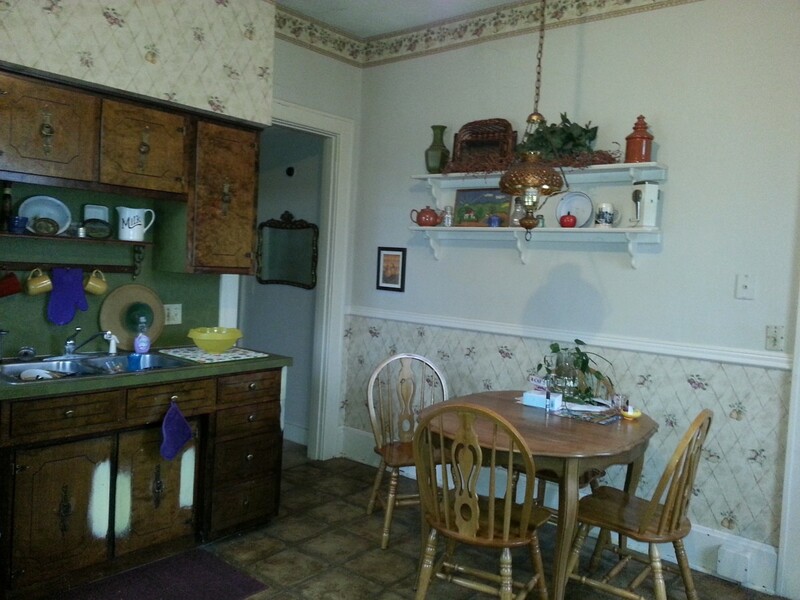 I have a small kitchen which has red brick on one wall and as a backsplash. My counter top is a black faux marble laminate. I was considering putting pewter hardware on the cabinets. My appliances are white. My floor is a light grey. I have one other wall that is currently a peachy colour (this could be changed). What colour would be best for the cabinets and doors? I have a few questions about my kitchen. We just bought this place and I have no idea what to start with for colors. I like the countertop and I think that will be my jumping off point. I am planning on painting the cupboards, walls, trashing the curtains, and possibly putting blinds instead? The decorative little shelf off to the side is also going, but I thought maybe adding a small ledge for a breakfast bar there and a couple of stools? So what colors where? The floor is a neutral linoleum tile which is brand new so I plan on keeping it for a while. I am working on a bit of a budget here so it's mainly getting paint. Suggestions would be great! Thanks. I think I'd paint the cabinets white, install some new cabinet hardware, and paint the walls a neutral beige (a color pulled from your flooring). Depending on which direction your window faces I might even skip window treatments. The idea for a breakfast bar is great. Good luck in your new home! White cabinets, nickel colored cabinet pulls to match the sink, and the room appears a bit dark in the photo, so I would stay with a very light color for the walls. 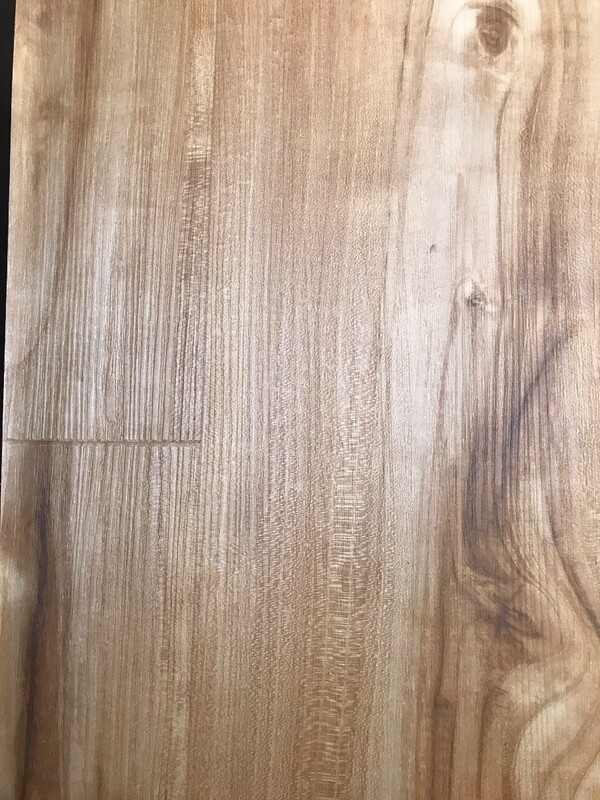 If you intend on lifting the flooring for another color in a few years, then I'd go with a color that compliments the countertop to keep from having to repaint anytime soon; otherwise, go with a color from the vinyl flooring as was already suggested. I agree, white cabinets, light colored wall, like a pale beige and some nice cabinets pulls if you can afford it. Those things are so expensive. Depending on the pulls they may can be painted too. I'd get one of those blinds that look like wood. That's what I put in my kitchen and they look like real wood. There was previously an ugly blind there and changing made a world of difference. I think getting rid of the "thing" you talked about is a good idea and it will make the place look bigger and more updated. That spindley thing has to go. That is dated. I agree with white cabinets. Good luck. I like the idea of a breakfast bar and white cabinets also, but I would go for a zippier color than beige for the walls, and still keep them light. You might want to paint the ceiling a darker hue than the walls and install white crown moulding all around to tie in with the cabinets. That's what I did in my new bathroom, and I love it. The photo doesn't show it properly, but the walls are a light sage green with a darker hue of the wall color on the ceiling... I haven't finished decorating yet, but you get the idea. Chocolate brown, gray, or white cabinets and lime green, orange, or yellow walls. Unless the window is right at ground level and people can see in it I wouldn't worry about a full curtain or a blind. Just a valance at the top. It may brighten it up enough that you won't use the light much. I disagree with everyone that says paint the walls beige. Boring. Make it bright, fun, playful and cheery. The window will be getting nothing if I can help it, blinds if my husband can't handle nothing on the window.....lol. And I have decided to switch out the countertop to a more neutral one, thay way I can add more color with paint in the future. Also hoping to convince hubby that a new faucet is needed there ;). Thanks for the input everyone.very helpful! I promise to post a photo when I get it all done. We are going to do a minor update on our terribly outdated kitchen. If it was up to me, I'd be tearing out the whole thing and starting over. It currently has very dark cabinets with reddish-orange terracotta tile countertops. Unfortunately, we are only going to be painting the cabinets instead of replacing the whole mess, so I need some ideas on colors for the cabinets. Any help would be welcome. Have you considered painting just the cabinet doors? If the cabinet shows around the doors, this could look very new. You do need to stay in the same color family as the counter top and cabinets, but you can go much lighter or do a stripe or a sponge print. New hardward might be a way to update the look. 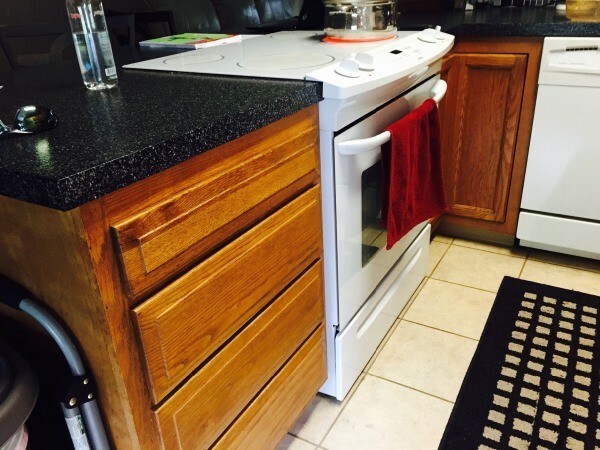 If the cabinets are very dark, it may take several coats to cover the old color. A quick, cheap fix is wall paper or stenciled design. Pick out a light color from the tile and use that as a guide. If it is the same color, you can go with a tint (color plus white) of that color. Hope this helps. I have brown wall tiles, not a solid brown, but mostly brown. What colour can I paint my cabinets to lighten my kitchen and one that does not clash with the wall tile. Our kitchen has pale rose walls, brass squares for a back splash, cream colored appliances, and dark beigey brown counters. The floor is a light maple. The cabinets are antiqued cream. I am wondering what color would be prettiest for the cabinets. I also have an odd chandelier made of a blue and white coffee pot with matching cups and saucers for the arms. Is there a way I could make a feature of this? I am moving next month and my kitchen is grey, but my furniture is red and gold. What color can I paint the walls to blend with both? Thanks. I have dark brown kitchen walls, which I love. What color should I paint my cabinets besides white? We're creating our kitchen. The floors are a very dark wood, African Mahogany. 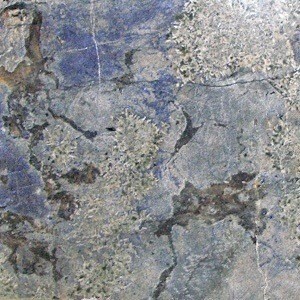 We've chosen a blue granite counter top, close to Blue Persia. The question is what would be a good color for the cabinets. One thought is having new cabinets painted cream, or a natural wood color. If the wood is on a darkish side will that work with the Blue Persia granite and the dark floor? White or a darkish color will go with your counter top, good luck. I think a white, off-white or a white with a glaze that has a hint of gray in it. If I'm seeing this correctly, there is a little gray in the blue countertop. Might be nice to pull that out subtly. Sounds very classy! 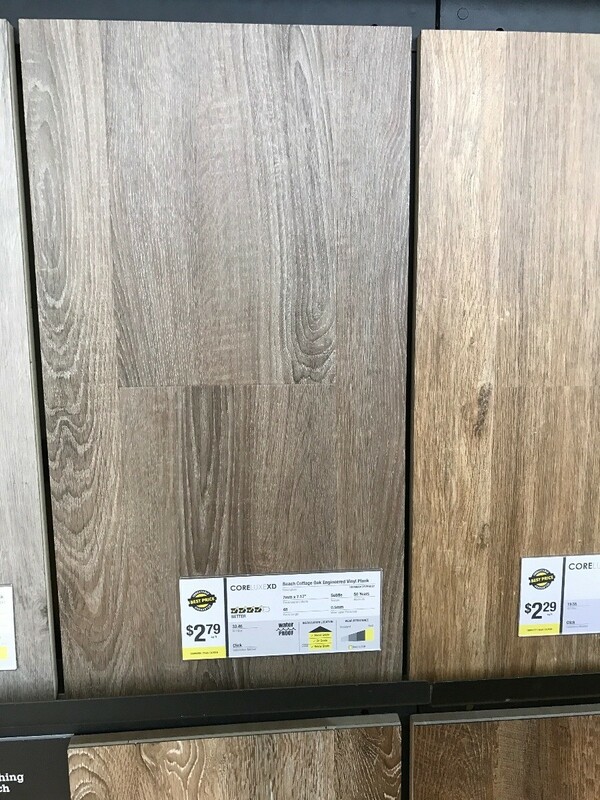 If it were me, I would take a sample of the flooring in to the cabinet store, then either match the cupboards to that exact flooring color or go several shades lighter in the same hue. You can go dark or light with that color of blue. Cream would also look nice... If your kitchen is large, go with darker cabinets, if it's fairly Small, go with the Cream color you mentioned or another light color to make it feel larger! Also, a dark Blue cabinet would look nice, but wouldn't be great for re-sale. Stay with mainly neutral colors for good re-sale value! Stay with the colors in the counter top; you've got several to choose from. Don't know what color your walls are, but if they are white, then paint the cabinets darker than the walls to bring it together; otherwise paint the cabinets the palest shade in the granite. I lived in Africa once, and seeing that lovely blue with hints of green in it reminded me of the lovely days in the Highlands of Kenya. How about a soft green taken from the dark streaks in the granite; a pastel/light version. It would be like the blue skies and green of Africa, with the dark woods you find in most houses there. So I posted a while back asking about paint colors for the walls in our kitchen which opened the door for a whole new problem. Cabinet colors? Other ideas are more than welcome though! Side note- we do have under lighting under the cabinets. So when those are on it helps bring the shadow out. We are young homeowners and welcome advice. Help us! Thanks. My appliances are white, but my table is off white with a stainless steel top (so the legs of table and the chairs are off white). What color should I paint my kitchen cabinets? off white to match the table or white to match the appliances, or does it matter? My kitchen cabinets are cedar. 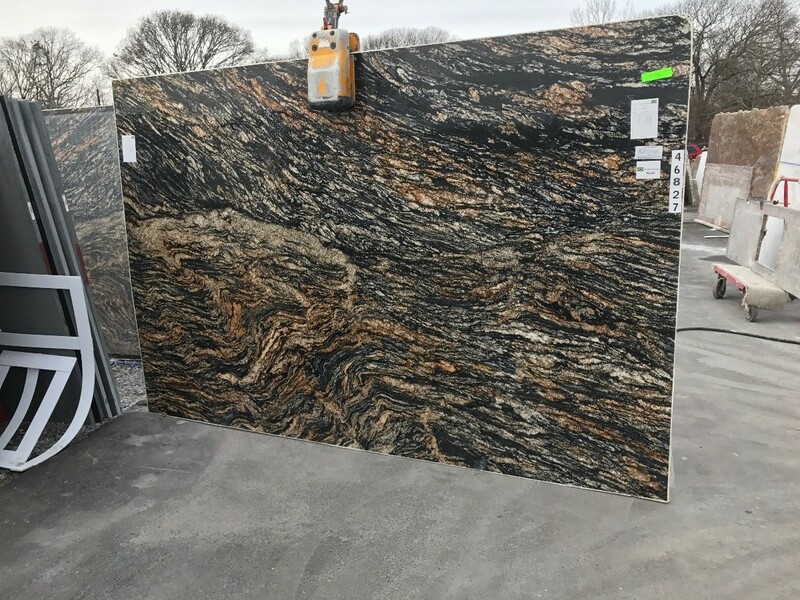 The counter top is a bluish-green with specks of black (granite countertop). The floor is vinyl with bluish green and off white squares. Please help me. I am working on a limited budget. I don't know what to do about the ugly cedar cabinets. It's an eye sore. Help! I need to paint my kitchen cabinets and I don't know what color to paint them. My kitchen is pretty small, and we don't have a lot of light. I love Italian, so I painted the walls a golden yellow color with faux brown on top of the gold. 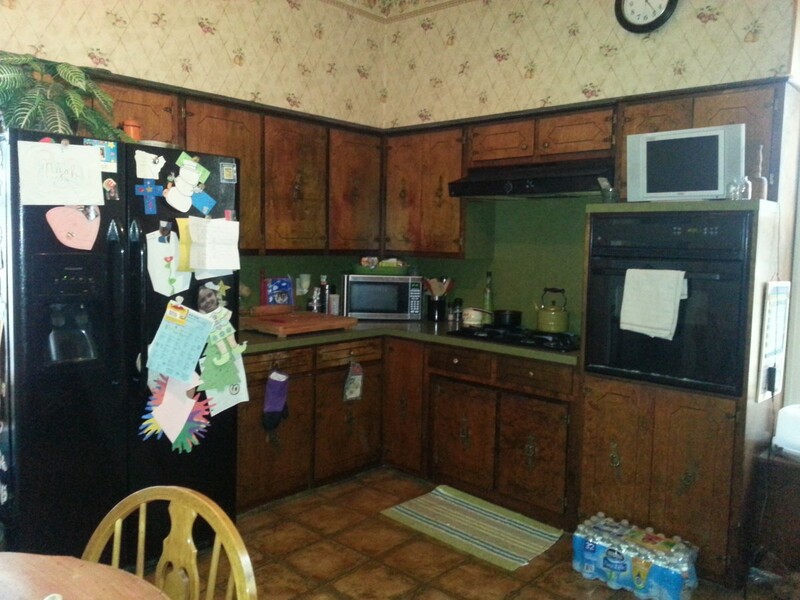 The kitchen cabinets are totally flat and are a cheap laminate with no design whatsoever. The counters are a dark speckled brown laminate. Help me please. When you give me some colors to pick from, I also need to know what color hardware (hinges and knobs) would look good. I'm going to replace all the hardware. The cabinets are over 25 years old. 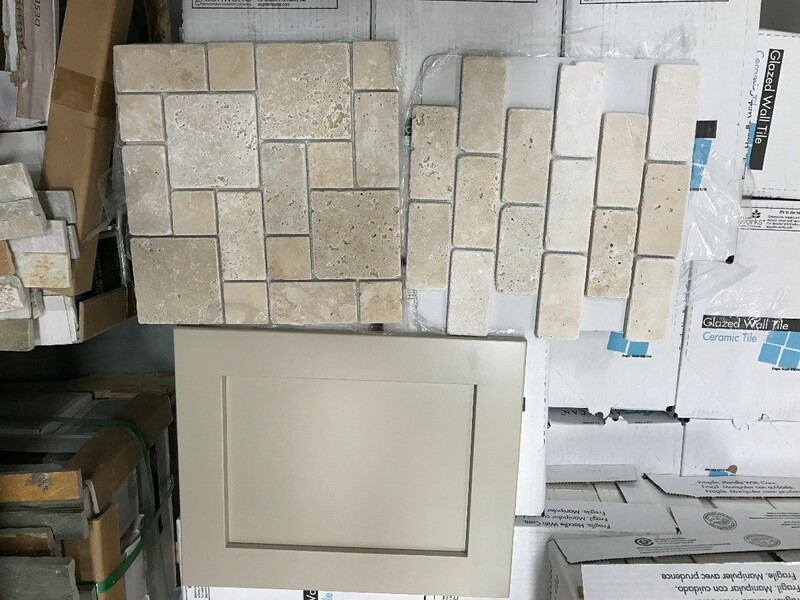 I think these two links will provide you with enough research information on Tuscany color schemes for you to work with your kitchen cabinets and hardware. Good luck and mostly, enjoy your work! The first thing that came to my mind was to paint the cabinets the same golden yellow as the walls, but without the faux finish. If you think that might be too bright, use one of the lighter colors on the same color strip. You can find really pretty knobs and handles in a bronze finish at Wal Mart. They are rich looking and very reasonably priced. I don't have any advice about paint color, but I do have advice about painting over laminate. First, you have to sand every inch of your cabinets with 220 grit sandpaper (I would remove the doors, and all hardware, and lay them on a flat surface). Then clean them with a tack cloth to remove anything left from the sanding process. Next you need to use a primer designed to be used with laminate, such as Zinsser Bulls Eye 123. Follow the directions on the primer and allow for the correct drying time. Then you can paint with a gloss or semi-gloss paint designed to hold up under lots of use. I have navy blue counter tops and white cabinets. I want to paint my cabinets, what would be a good color? My kitchen walls are a light gray! I have dark cabinets with coppery brown appliances. What colors would you suggest I paint the cabinets? My flooring is gray/brown/beige tiles. 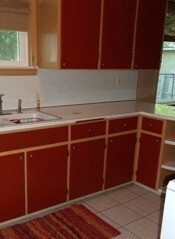 I want red dishes and decor for my kitchen, but I'm unsure of what color to paint the cabinets and walls. Any advice would be greatly appreciated. Thank you. Red is a very bold color, me, I'd just go with a very bright white and maybe a little red trim. Why not use an olive green? I like the italian kitchen feel of green and red, you can add some black or gold in the scheme also. Good luck. Our kitchen has good cabinets, but they are pickled oak with really pink counter tops. We painted the walls tan or coconut milk whichever and the floors are light tan tile. I am thinking about painting the cabinets white and changing the hardware to silver and changing counter tops to a tan or brownish laminate. What do you think? 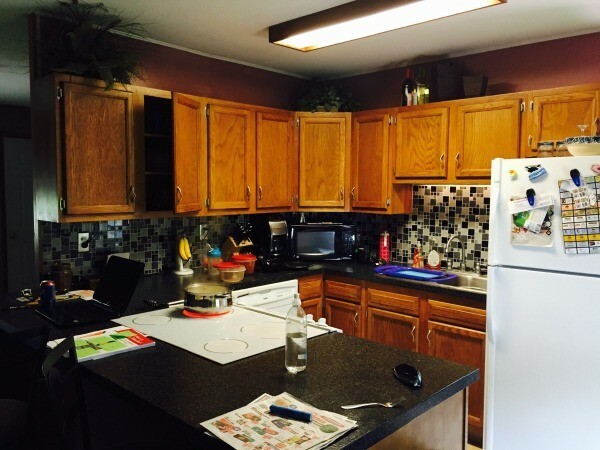 What color should I paint my kitchen cabinets? I have tan tile floors and dark tan granite counters. 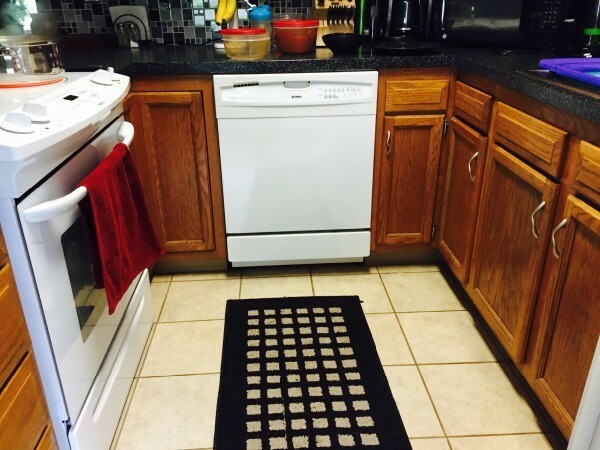 We also have stainless steel appliances and bright white wood baseboards and crown moulding. Our kitchen walls are also tan. I need some color! I was thinking about very pale, dusty robin egg blue, but don't know if it will work. I currently have maple colored cabinets and I want to paint them. My counters are cranberry and the kitchen opens to the living room which is a mix of browns, cranberry, green blue, and gray. My appliances in my kitchen and my kitchen walls are white so I am not sure that I should paint them white. However, I do want something light that will open up our kitchen space. Please help! I would like to update our rental to sell. The kitchen is awful, with handmade cupboard doors, uneven, rough edges. I have acquired some cabinet doors that are in good shape, but will need to be painted. The tile is an ugly beige/yellow that will be staying, unfortunately. Also, I have white appliances. What colour could I paint the cupboard doors? White? I feel like this will add even more contrast to the flooring. Should I paint the wooden cabinets in my kitchen to match my walls or a little darker than my walls? I am using Benjamin Moore, Elmira white, it looks like a light gray.